For an interactive presentation of the coffin and its iconography and inscriptions, see “The Digital Afterlife of Ti Ameny Net,” created by Nils Niemeier (’13), based on “Ti Ameny Net: An Ancient Mummy, an Egyptian Woman, and Modern Science” (Lora Robins Gallery for Design from Nature, 24 February – 16 November 2012). 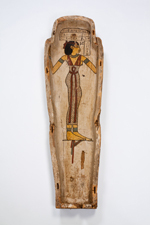 A mummiform coffin showing an elaborate toilet from the waist up. It consists of a headdress of vulture wings descending behind the ears and surmounting a huge wig which falls in masses upon either breast. Around the neck is a broad necklace of many bands terminating below in a pair of outstretched hawk's wings, attached to the outspread arms of a crouching female genius. From the waist down the surface is blocked out in rectangular fields, bearing mortuary prayers and scenes. 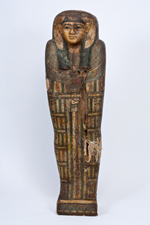 Over the abdomen is the bier bearing the mummy. The foot of both is visible. Above this hovers a human headed bird, which represents the soul of the deceased, and beneath the bier are four jars, one broken away, containing the viscera of the deceased. Prayers to four genii for the protection of these jars are written on either side of the bier, and below it, in six long columns, are prayers for the maintenance of the food, drink, and clothing in the hereafter. Similar mortuary texts occupy the spaces on either side of these long columns, and are continued also on the back of the case, each side the middle. As an example of these texts, the one on the back of the left shoulder reads "an offering which the King gives for Osiris who presides over the West, lord of Abydos, Keb, prince of the Gods, Tum, Lord of Heliopolis, Anubis, master of enbalming, Lord of Ta Zoser, Osiris, Lord of the dead. May he grant mortuary offerings, one thousand fine linen, one thousand loaves, one thousand jars of beer, one thousand oxen, one thousand geese, one thousand incense, one thousand fine linen, one thousand obligations, one thousand food offerings, one thousand wine, one thousand milk, one thousand of everything good and pure, one thousand eternities for the double of Osiris, the lady Ti Ameny Net, deceased." Such prayers are magically potent to procure for the dead all of the things enumerated. On the feet are the sacred eyes, and down the middle of the back the great symbol of Osiris, the Uraeus. Within at the top on both parts is another prayer, and beneath these the standing fiqure of Nut, goddess of heaven. The coffin is of sycamore wood covered with cloth stuccoed over, and the painting is in watercolor. The lady was the daughter of a man named Nesy Amun and a woman named Ruru, or Lulu. From the style of the coffin the lady was evidently a person of wealth, but seems to have held no official station or rank. In 2013, Patrick Salland provided a new translation of the hieroglyphs on the coffin. The full translation is available here, and it is also incorporated into the interactive exhibit.